It’s been chilly for spring lately, even here; over the weekend we got what will hopefully be the season’s last bout of snow and freezing rain. To me, cold weather makes me crave solid, hearty meals — although I have to admit they’re not always the prettiest. Covered in gravy like that it doesn’t look all that appetizing, I know, but it really hit the spot. 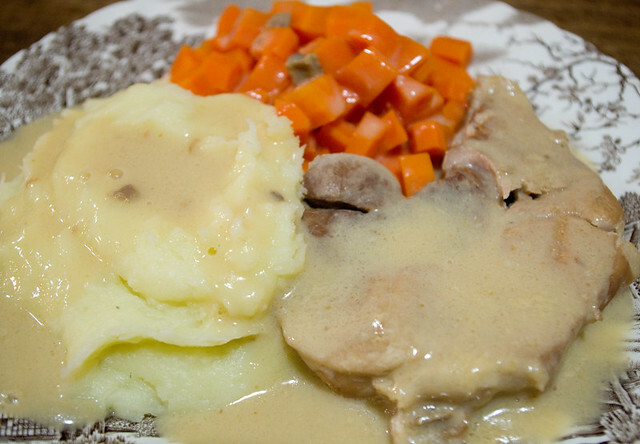 I actually cooked these pork chops & mushroom gravy in the Instant Pot, although with having to boil down the gravy to a decent consistency afterwards I don’t think it actually saved me any time. The flavour itself was pretty much identical, too. Although there was nothing actually wrong with cooking them in the pressure cooker, I don’t think I’ll be making them this way again, since it was neither easier nor quicker. Well, unless my stove goes on the fritz or something, or it’s a really hot day and I want to cook outside (although by then I’d hope that I’d have the barbecue up and running). I made the mashed (well, technically whipped, I find them smoother that way) potatoes the traditional way, on the stove. Perhaps if I wanted to switch the roles around I could do the potatoes in the Instant Pot and the pork chops on the stove. It really makes cooking them a breeze, and that way I don’t have to worry about the pot on the stove boiling over — again. And I could possibly cook the potatoes and the carrots at the same time, like I did with the pot roast. That might be worth trying.